"Someone is here to see you." Someone's here to see me? 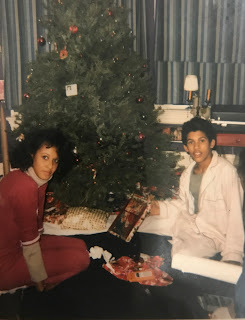 It's late morning on Christmas Eve, 1988. I have just driven 375 miles to Berkeley from Los Angeles for a quick trip to see my mom and my brother, Kenji. I am glad to be home, but I'm eager to get back to my new job at the St Mark's supper club in Venice. The other hostesses have told me that we will really clean up on New Year's Eve. One of them said she made $500 last year. I really need that kind of NYE money. I'm already a month behind on my rent, my car payment is due next week and there are these dope, brown, over-the-knee Charles David boots that I REALLY want. My mother's voice is tight with concern. I search her eyes for an explanation as I rise from her time-worn, paisley bedspread-covered sofa, where I'd been napping after my drive. "What Mom? Who is it?" She is silent and barely moves to the side as I get up and approach the doorway where she stands. I tilt my head slightly as I scoot past her, pushing opening the rickety screen door. I look back at her one more time before I step outside with a questioning look. Who knows I'm here? And why is she so upset? I hear Bobby Brown's "My Prerogative" blasting from the street as soon as I open the door. I shade my eyes from the bright sunlight as I survey what lies beyond my mother's wide sitting-porch. All at once, I see that an older, grey, Chevrolet Malibu has missed her driveway completely and is parked at an angle across her lawn. The car is still running. The melancholy stink of exhaust fumes fill the air. Oh my God! There's a car in the yard! That's why she's upset. But who's that White guy behind the wheel? After taking a step forward, I can see that Greg, Huey's best friend is in the driver's seat. Even at that distance I'm able to make out the sweat glistening on his forehead. It looks as though his blue eyes are too wide as he waves apologetically and turns the music down. The passenger seat is empty and the door is open. All at once, Huey's walks out of the shadows with cartoonish chuckle. He's been standing to the side of the porch. "Hey, hey," he says with his arms up in a mock surrender. "I come in peace." He is standing at a tilt on the grass-broken cracks in her walkway. He smiles and starts up the porch with a decidedly uneven gait. Oh Shi* - is he drunk? What are they even doing here? How did they know I'd be here? "Huey?" I say quietly, not wanting my mom to hear the alarm in my voice. My mother bursts out of the house. Her posture is menacing, a warning. Huey slows down at once and stops on the third step, looking frantically from me to her. He sniffs loudly and gives his nose a generous wipe with his leather coat sleeve. I am temporarily mesmerized by the slimy streak it leaves behind, like a snail trail. 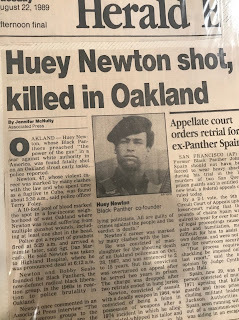 Should I tell her that this is actually Dr. Huey P. Newton? The co-founder of and former Minister of Defense for the Black Panthers? The man who studied our gun laws furiously until he found a loophole in the second amendment that guaranteed his right to bear arms and patrol neighborhoods, protecting Black people from the police? The man who coined the term "Revolutionary Humanism?" The man who took it upon himself to implement hot breakfast and after school programs in the inner city neighborhoods of Oakland and Chicago? The man whose arrest sparked protests across the nation in 1967 ? Remember the "Free Huey" signs? "You can jail a revolutionary but you can't jail a revolution." "I just need to show you something," Huey stammers. His smile has disappeared and his voice is higher than normal, almost whiny. My intuition shoots a wall between us, I take a step back toward my mom's protective energy. Huey looks up and grins again, seemingly emboldened by my question. He dashes up the last two stairs and grabs my hand with surprising speed. His fingers feel incredibly soft and sweaty, like five over-sized bait worms. I want to wrench my hand away, but I don't want to give my mother any more cause for concern. Okay, no. Don't tell her who he is. Just get rid of him. "It's okay Mom," I say as casually as I can. "These guys are my friends. I'm just going to walk him back to the car." My mother folds her arms and keeps her post on the porch. She cranes her neck a little as she watches Huey leading me across our lawn. Greg gets out as we approach the driver's side door. "Hey Greg," my voice is full of prickly irritation. "What are you guys doing here?" "We just had to show you something, Laura. Can you take a ride with us?" I look back at my mother. She's on the top step now, her eyes tracking Huey's increasingly erratic movements as scurries backward to open the trunk of the car. Once open, Greg steps out and motions me closer, leaving the driver's side door open too. "You're going to want to come with us after you see what's in this trunk!" Huey says as he leaps forward. He grabs my right arm and ushers me to the back of the car. "How did you guys know I was in town?" I hiss under my breath as we exit my mother's line of sight behind the open trunk. "We called Kelly and she told us where you were." I knit my brows and narrow my eyes, making a mental note to "check" our mutual friend Kelly next speak I with her. What is she thinking sending these drunk mutha fu@@a's to my mother's house?!? But my angry expression fades into one of disbelief as soon as I look into the trunk. At first I think that the sun is messing with my eyes. I look from Greg's face to Huey's and back to the contents of the trunk. Huey starts laughing manically and hopping up and down. "You're gonna take that ride with us now, aren't you?" The trunk is large. Large enough so that three or four people could fit inside easily. There are a couple of brown and charcoal colored blankets (or mats) that have been folded back from the middle, like you would if you were going to change a tire. There are hundreds and hundreds of hundreds. The money is not stacked and banded like in the movies, but loose, like someone has casually dumped a few trash barrels of Benjamin's into the trunk. "This has got to be like a hundred grand," I whisper to myself. I hear the haze in my voice. The money has put me into a trance. "You ready for this?" asks Greg excitedly. "It's no 100K, Laura - this is two point one million dollars!" Two twenty-somethings with bulging Jansport backpacks are walking past my mom's house now. One has long black hair and Birkenstocks, the other is skinny with a shaggy, Peter Frampton haircut. They have stopped talking to each other and are now watching us with intense curiosity. I shoot them a "mind your business" look as I put my hands on Huey's shoulders and reposition him so that he is blocking their view of the trunk. "Lower your voices," I say to them though gritted teeth after they pass us. I should walk back in the house right now. Someone is definitely looking for this money. But for some reason, I just stand there, my right hand hovering above a particularly large mound of cash that is piled in a ring around the spare tire well. How deep does this money go? One foot down? Two feet down? I put my right hand in the trunk, moving as much of the cash as I can to one side. It's almost elbow deep. The cash feels cool, crisp and smooth against my skin. That's when I saw it. The spare was gone and there was something else in its place. How the hell did miss that?!? There, right in front of my eyes are two, pure white, overly full, sack-of-flour-sized packages, swaddled in several layers of plastic wrap. Are those what I think they are?!? Huey sniffs again. The sound startles me back to reality. I look back and forth in astonishment from Greg's dilated pupils to Huey's fidgety stance. I peek around the open trunk to see if my mom is still standing there. I can't see her on the porch anymore. "Take a ride," Huey sing-songs enticingly. "A quick ride, we'll have you back before noon." I shake my head slowly as I back away from the trunk. "Where did all of this come from? Did you guys rob some drug dealer or something?" Greg laughs too loudly and Huey joins him in the hysterics after a few seconds. I look around in a panic until they stop, terrified that they're going to attract more attention. "Nothing like that," says Greg finally. "Let's just say," says Huey. "That someone made a rather generous donation to the cause." Greg spins me around so that I'm facing him and grabs my hands in his. Unlike his face, his hands are bone dry, almost leathery. "Come on, Laura. We'll give you some of it. As much as you can put in your purse. We just want you to drive with us for a little while." As much as I can put in my purse? Sheee-aaat! That's a year's rent! Those boots I want and maybe my car payments too!! "Just get in," pleads Huey. He's walked back to the passenger door now and is holding it open for me. Greg takes my stunned silence for a yes and "yippee's" with a little fist pump as he hops into the driver's side, closing the door after him. The door slam brings my mother back out onto the porch. All at once, my mom's house looks especially shabby. All I can see is the gray and white peeling paint, the torn screen door and the "lawn" that is as much dirt (and weeds) as it grass. Maybe I could give her some of this money. She could use it to fix this place up! My mom mouths "Are you okay?" to me. I gulp and nod at her with a what I hope is a comforting gesture. "Laura?" calls my mom. "What's going on?" I nod slowly and hold up the palm of my hand toward her to indicate that I need a minute. I feel my shoulders drop as I walk toward Huey. I shake my head "no" as I get close to the door that he's still holding open for me. "I, I can't go." I can barely believe the words that are coming out of my mouth. Huey follows my gaze and looks up at my mom. His eyes soften with understanding and disappointment. "Hey, I get it," he says dejectedly. "Do you want some anyway? You could just grab little. I'll open the trunk again." My Mom is down on the bottom step now. My heart starts banging a hole in my chest. I hug Huey quickly. The smell of the Aramis cologne he wears is so strong that I can actually taste it in my mouth as I pull away. "I can't, Huey. But thank you anyway." My heart sinks when I flash on those beautiful, buttery, brown leather boots. "Where are you guys going to go," I say softly? "I'm not sure," says Huey. He smiles as if to cheer me up. "But I'll call you when we get there." 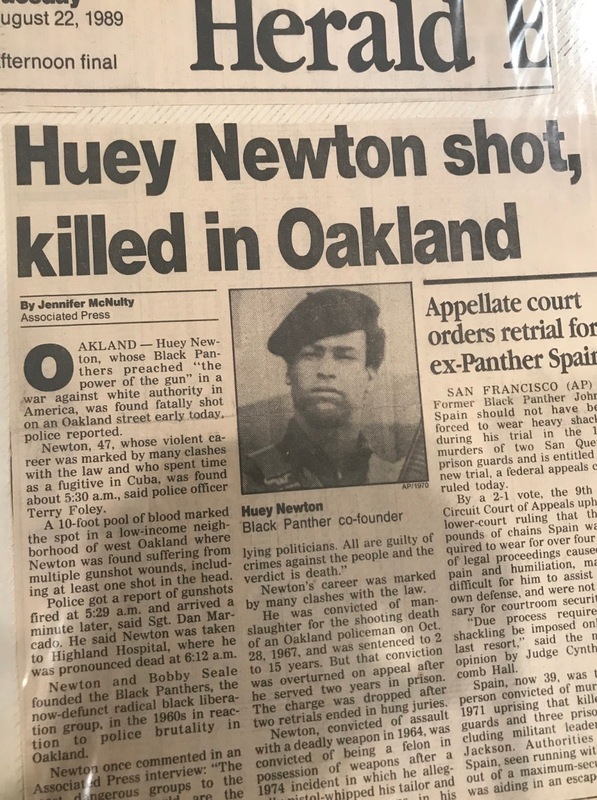 Huey Newton was a great guy -- a genius in my opinion. And despite this rather unflattering depiction of him in this outrageously bazaar, but completely true story, Huey was a hero, a role model, a leader and my friend. When I first moved to LA in 1988, it was Huey who got on the phone and introduced me to people who could help me get a job in the entertainment industry. "Bert, yeah, it's Huey. Looky here! I need you to meet this young gal that's just moved to LA, she wants to direct commercials. She's a friend of mine. Take good care of her, okay?" But some of our best conversations were those in which he would take time to break down his role in the war that he spent his life waging against the status quo. "I am a doomed man," he would say dramatically between sips of Hennessy. "But all revolutionaries are -- so it's not death that I am afraid of -- but it is a death without meaning that scares me." That producer he called on my behalf was Bert Schneider (The Monkees, Easy Rider, Five Easy Pieces, Hearts and Minds). Bert took me out to dinner at Dan Tanas shortly after my Christmas trip home that year. We laughed and talked non stop — mainly about Huey. I found out that Bert had been a generous, long time supporter of The Black Panther Party for Self Defense. "But I think Huey may be losing it," Burt says to me in confidential tone over our coffee and cheesecake. "He called me a couple of months ago begging me to have someone come and pick up some two million dollar car..."
My fork slips out of my hand and drops off the side of the table. Suddenly the cacophony of dinner conversations around us are locked out -- like a bank vault door has just been slammed shut. "Yeah," he smiled. "You wouldn't believe it! He was all hyper and paranoid about some "mysterious" car with two million dollars in the trunk. Talk about delusional! Oh yeah! I forgot -- he said there were also two or three bricks of coke in the trunk! Yeah, right!" "Huh?" Bert looks up at me innocently as he wipes his chin with his napkin. "I know about that car, Bert." I clear my throat. "He came by..."
"Oh, he told you too? Did he tell you the bit about how he and Greg were both so loaded that they stopped by someone's house to ask them to stash it for them? Isn't that a riot?!? Get this! They didn't trust themselves to remember where'd they parked it. It was like they wanted a real live treasure map." A treasure map! That's all?? Damn!! I should have taken that ride!!! "Oh my God, Bert!" My voice is thick with emotion. "That was me! They came to my mother's house on Christmas Eve! I saw that car!" This time Bert drops his fork. "What do you mean? You were the treasure map? You saw the money"??? "Totally true. I saw all of it. It was too much money to count. I saw the packages too, all sealed up. They wanted me to go with them. They seemed pretty desperate, but it felt too shady. Plus my mom was right there on the porch watching us. They offered me cash, but I didn't take any. They wouldn't say why they wanted me to get in the car with them." "And you didn't just take a little cash?!?" He laughs, picking up his fork again. "You know you could have given some to your mom." "What happened to it?" I lower my voice to a whisper, suddenly conscious of other diner's eyes on us. "Did he say what they did with it? The car, the money?" "That's just it," Bert is visibly agitated now, clearly replaying his conversation with Huey in his head. "They parked it in some lot in Emeryville and now they can't find it! They've been looking for it since Christmas." Bert sent various private investigators to the bay area to look for that car for six months after I confirmed Huey's story to him. It wasn't until Huey was assassinated in August of 1989 that a heartbroken Bert gave up his search. We were both greatly saddened and angered by Huey's death (which had all of the earmarks of a cover up, but that's another story). My friendship with Bert is just one of the many things for which I am deeply indebted to Huey. My friend Victoria, (who happens to be White) won't engage in politics because she doesn't believe in "these limited barriers that people use to separate themselves." "Skin, hair, where you are born, who you love, what language you speak, how and what and if you worship -- these things don't really matter. We are all souls confined in these vessels for a finite period of time. Why are we fighting over the vessels?" My first thought was, Really? Wanna trade vessels and see if you still feel the same way? But the truth is, that the more I think about her words, the more I feel like she might have the right idea. Scottie and I do an annual road trip every summer with our kids and my mom. And in certain states, at certain times, when we all walk into a restaurant for a reservation (that I've usually had to have made months in advance) we get -- looks. Sometimes our big, blended, multi-skin-toned family is greeted with genuine smiles and other times, well -- we aren't. Because depending where we are and who we meet, all that some people can see (and pre-judge) are the vessels in which we are all contained. They don't or can't see the strength of our connectedness, the love we have for each other or feel the sheer joy that emanates from each of us because we are all together. There are thousands of people who are making a daily effort to clear away the thick climate of racial hatred that looms low over our country right now. But as hard as all those people may be trying to "move the needle" by protesting, lobbying or campaigning, the discouragingly difficult-to-look-at truth is that needle hasn't moved very far (and frankly isn't moving very fast). According to an editorial in the Sunday New York Times last month, there are three main pathways by which social movements gain power; Cultural, Disruptive and Organizational. In 2009, Scottie flew me out to Richmond, Virginia to meet his dying father, Harry, who had a major stroke and couldn't move or speak. Little did Scottie know, that by taking this one simple action, he inadvertently started a "change-reaction" that permeated and affected his whole family. Harry was an admitted racist. Scottie's mother Nancy, was a gentle, Southern woman who had lived in Richmond her entire life. She was kind to everyone, but all of her friends had always been White. Scottie's daughters, Lily and Nora, grew up in the very homogenous, Park City, Utah, before moving to the even more homogenous, Stowe, Vermont. But yet, when Scottie fell in love with me, everything changed for the Slaughter family. There was no questioning or bargaining. Scottie was with me. He loved me. He wasn't letting me go anywhere and he wasn't going anywhere without me. So Harry and Nancy did what any loving parents would do, they made an effort to see me through Scottie's eyes. One by one, they both abandoned their old, limited ideas of what it meant to be Black. Nine months after meeting Scottie, I found myself pacing back and forth outside of an ICU hospital room. Inside the room, Nancy and Scottie were preparing Harry to meet Scott's first Black girlfriend (me). When they motioned me in, the stern-faced, balding, small-framed, White man who lay under a thin, pastel colored hospital blanket literally took the breath out of my body. "Hi," I exhaled. "It's so nice to finally meet you." My heart beat was noticeable under my black, cashmere crew necked sweater. I scrambled around the foot of the bed and hurried over to his right side (Scottie had said that it was his good side). Harry's thin, pale arms lay motionless on either side of him until I got near his face. Unable to move his head, his eyes followed me, as I set my purse down on his nightstand with a thud. Without warning, Harry's right arm sprang into action and scurried across the blanket. I startled at how quickly his hand found my fingers, grabbing and clutching them with impressive strength. Before I knew what was happening, I felt his thin, soft lips on the back of my hand. Scant tears appeared in the corners of his tender, Cornwall blue eyes. "Beautiful," he mouthed to Scottie. "She's beautiful." Shortly after his death, Nancy and my mom, Linda became instant, close friends (they were hilarious, goofy, secret-sharing buddies from the gate)! And eight years later, before quietly passing away from ovarian cancer, Nancy, cupped my face with her hands, kissed me tenderly on the cheek and thanked me for loving her son so fiercely. "You do too much," she smiled. "But I am so grateful..."
Lily and Nora have basically only known a family that included a Black stepmother (me) and Black brothers (Miles and Justin) and a Black grandmother, grandfather and uncles (my parents and my brothers). Their instinct to pre-judge ANYONE has been tempered by the love that they've experienced. But a real change of perception needs a generation or two to take hold. You see, Harry and Nancy didn't really release all of their old ideas about Black people when Scottie brought me into their lives, but they did learn to love and accept my family and I. But it is with Lily, Nora, Miles and Justin that the real change is occurring. It's not that our kids don't see color, but they just don't see color as a barrier. Harry Slaughter would have probably never responded favorably to a protest march or some impassioned civil rights speech on television (what in God's name are they complaining about now)?? But his heart turned to butter when his son brought me into the ICU that day to meet him. He saw beyond my vessel and held my hand, whispering to Scottie that I was beautiful. "Thank you for taking time out of your day, Grandmother. I need to speak with you about the girl that I've been seeing." "Is this the brunette that you've been gadding about with?" "Yes, that's the one. But we're hardly gadding about. It's very serious." "I'm in love with her, Grandmother. I want to marry her." "And if it would please you, she would like to be baptized and confirmed in The Church of England." "I see. But am I to understand that she is divorced?" "Yes, Grandmother, she is. But the union didn't result in any children." "I'm told that she's an actress." "Yes, Grandmother. Her name is Meghan Markle." "Very well. I take it that Ms. Markle is not of the same (ahem) lineage as the other girls that you've dated before, is that correct?" "That's correct. She is American." "I'm well aware of that. But I was referring to her ethnicity not her nationality." "Um yes, of course. Her father is Caucasian, but her mother, as I'm sure you know, isn't..."
"Grandmother, she's um, well that is to say, her mother is Black." The media is in a frenzy comparing Ms. Markle to Grace Kelly. True, this is a fair comparison as Ms. Kelly was a beautiful, American actress who married into a royal family. But of course, Ms. Kelly was blond and White. 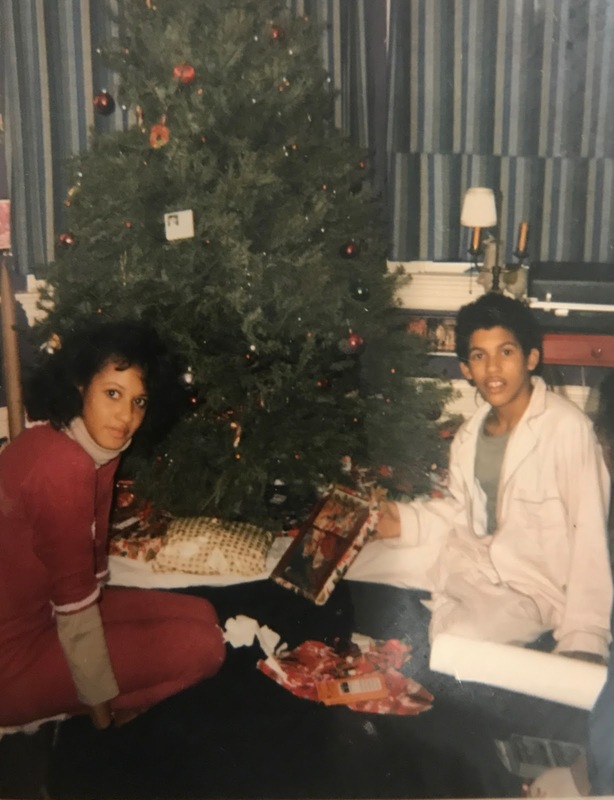 Ms. Markle's impending trip across the pond is more historically significant because of the simple fact that Ms. Markle is Black (I know, I know -- in the UK they're calling her "mixed-race," as her father is White.) But let's be real, there really isn't a "mixed-race" category here in the good ol' "Make America Great Again" United States is there?! Think about it - Halle Berry? Black. Tracy Ellis Ross? Black(ish). Former (beloved)! President, Barack Obama? He's Black too. Ergo, Ms. Markle is a Sistah. 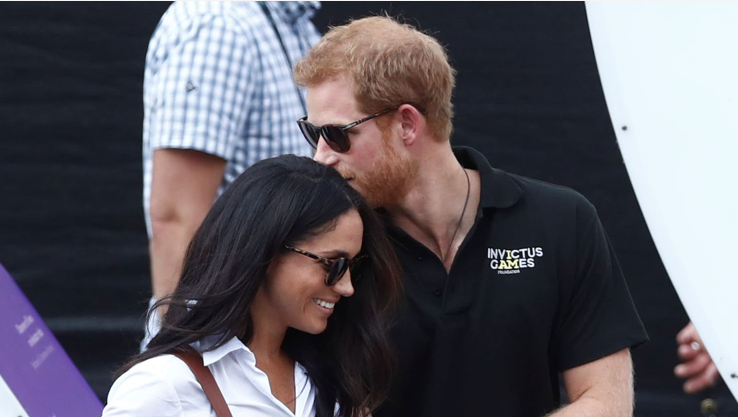 I saw an interview on Monday night where Prince Harry and Ms. Markle both said that they were dismayed by the "racial overtones" of the media coverage of their courtship and engagement. But I for one am overjoyed by those overtones. I don't want people to deliberately overlook the fact that she's bi-racial. I think that now more than ever, race needs to be part of the discussion. She's not just going to be any princess (with all of the inherent duties, titles and privileges), she's going to be Great Britain's very first princess of color! Prince Harry, British Royalty, fifth in line to the throne has fallen hopelessly in love with a soul contained in the vessel of a beautiful, slightly older-than-him, mixed-race, divorced, American actress. And if Scottie loving me could cause such a major "change-reaction" in his small, Virginian-based family, then what are the possibilities with regard to this royal engagement and marriage? 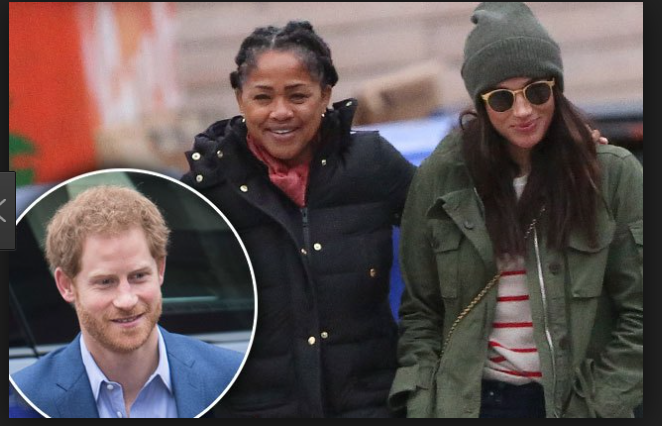 And while its true that Meghan Markle's upcoming journey to Buckingham palace is very appealing at a tabloid level (it has sent Black Twitter into another stratosphere)! What I really find to be exciting is the possibility that Ms. Markle's presence at Harry's side could finally mark the nexus between mere hope for a blind-hatred-free future and real, lasting change for all types of blended families. When Meghan and Harry say their "I do's,"it will become harder to hate people indiscriminately who are of a different race, sexual or gender orientation, religion or nationality. For how can one justify an unfounded distain for an entire group of people, when someone so posh, so royal and so well regarded, absolutely refuses to do so? If Harry loves Meghan, then perhaps it becomes a little bit more normal for a family to look like theirs, like mine (or like Noel's Norma's, Désireé's, Christina's, Nicole's, Amy's, Barbara's, Leah's, Troy's, Michael and Tony's, Victoria's, Derek and Rick's, Lilah's, Rochelle's, Rehani's, Jennifer's, Ling's -- and so many other of my friend's families). And maybe one day (long after I'm gone) all we'll really care about are those bright souls that shine within each of our vessels. But for now, I hope that people keep bringing home (to their respective families) whoever it is that they love and plant that seed of change. It may be America's best shot at real growth; one family at a time, one love at a time, one generation at a time. "The fact that I feel in love with Meghan so quickly was confirmation for me that all of the starts were aligned."